Although the image is highly abstract it still clearly depicts a series of classical nudes that exist in an abstract but recognizably pastoral landscape. 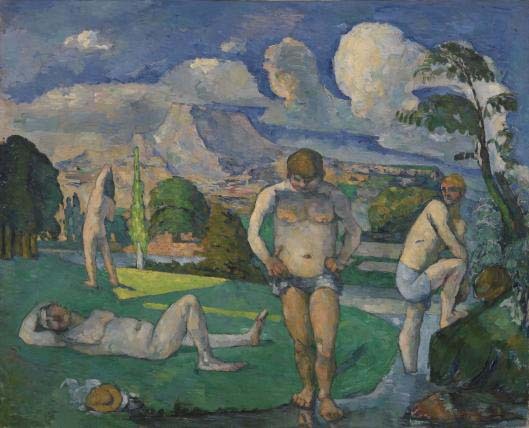 Also, the bold outlines of the figures emulate the way Cézanne outlined figures. 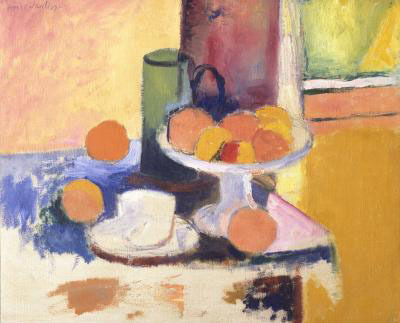 Furthermore, what may be the most important thing that Matisse learned from Cézanne is to conceive the painting as a whole and as, “a bound, energetic field of operation; that colors are the main forces playing on this field and that drawing could be produced by their relationship alone; and, even more, that there is no difference in color and drawing.” ( Bois, 2009, 111) This quote seems to describe what is particularly so masterful and unique about Matisse’s work, but what is interesting is how this distinction is directly inspired by Cézanne. 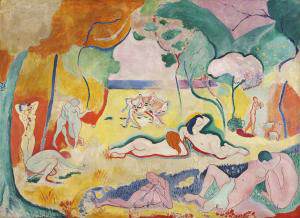 A uniquely fauvist quality of Joy of Life is the way the space is described in large flat areas of color. 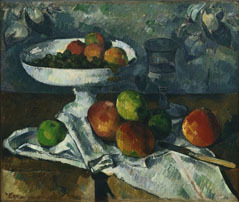 Cézanne himself would have been appalled to see these planes of color, but this technique creates an overall flatness to this painting (Bois, 2009, 111). This flatness throughout the picture plane is similar to the work of Cézanne, and can be seen consistently in the works of both artists, because neither one feels the need to use a lot of value to describe his figures. Artists such as Matisse and Picasso among many others have every right to speak highly of Cézanne, for he alone provided them with the freedom to bring art to whatever new realms they please. A quote by Matisse just about sums this up: “If Cézanne is right, then I am right.” (Bois, 2009, 114) The radical style of Cézanne provided a springboard for contemporary and modern artists to work from. To this day, artists are still inspired with the countless unique and alluring qualities Cézanne’s work has to offer, and thus galleries and museums are filled with his immortal influence. Bois, Yve-Alain. "Cézanne and Matisse: From Apprenticeship to Creative Misreading"" Cézanne and Beyond. New Haven, CT: Yale UP, 2009. 103-36. Print. "Cézanne's World of Influence." Philadelphia Museum of Art Website. Web. 25 Apr. 2012. <http://www.philamuseum.org/exhibitions/2009/312.html>. Elderfield, John. "Picasso's Extreme Cézanne." Cézanne and Beyond. New Haven, CT: Yale UP, 2009. 207-55. Print. Pioneering Modern Painting: Cézanne and Pissarro 1865-1885 (catalog of an exhibition held at the Museum of Modern Art, June 26-Sept 12, 2005, the Los Angeles County Museum of Art, Oct 20, 2005-Jan. 16, 2006, and the Musee d’Orsay, Paris, Feb. 27-May 28, 2006). Smee, Sebastion. " Cézanne 's World of Influence." The Boston Globe 08 Mar. 2009. Print.